Basic Keyboard Chords published by Santorella Publications is our best selling chord book for easy piano and an absolute must for any beginning student. 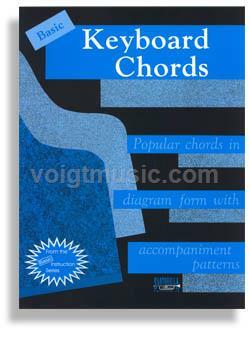 Learn all your basic chords with shaded diagrams of the keyboard and understand the construction of each chord with the appropriate notes written on a staff. From the most basic major and minor chords for one hand to the more complex altered chords and inversions for two hands. This best selling Santorella Publication is reasonably priced, easy to understand and thoughtfully laid out for pianists at every level.